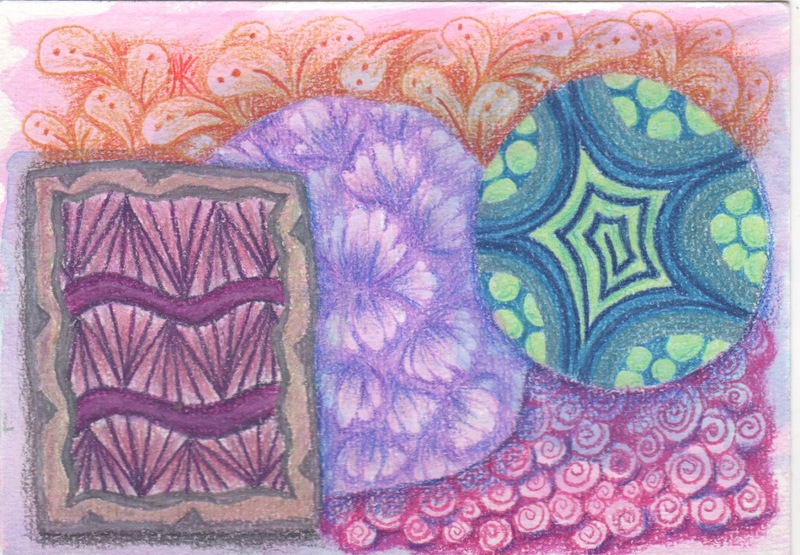 Katy Kehoe is a zentangle wizard! http://katykehoezentangle.blogspot.co.uk. And this one is made with coloured pencils. When I look at abstract work my first way in is to look for characters. That turqouise and green fellow is full of confidence and charisma. Lavender is more reserved and maroon and fuscia is elegant. They jostle for position. They meet in a room with decorations and colours to die for. My first reading doesn't jive with Katy's own assessment of her handiwork. 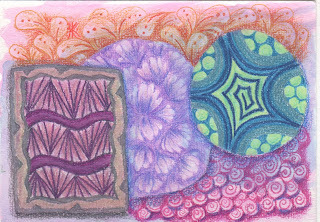 She says 'coloured pencil zentangle needs work' and 'unfortunate about the brown frame on left.' What I find is it's flummoxing the way sometimes people flock to the stuff that you made that makes you wince and they are indifferent to the one thing that gives you goosebumps. This alternative skype message has come to the right home! Thank you, Katy. I love it.